Time for a DIY! I haven’t had a chance to share a DIY in quite some time (I’ve been knee deep in book land), but I’m excited to share this one with you! 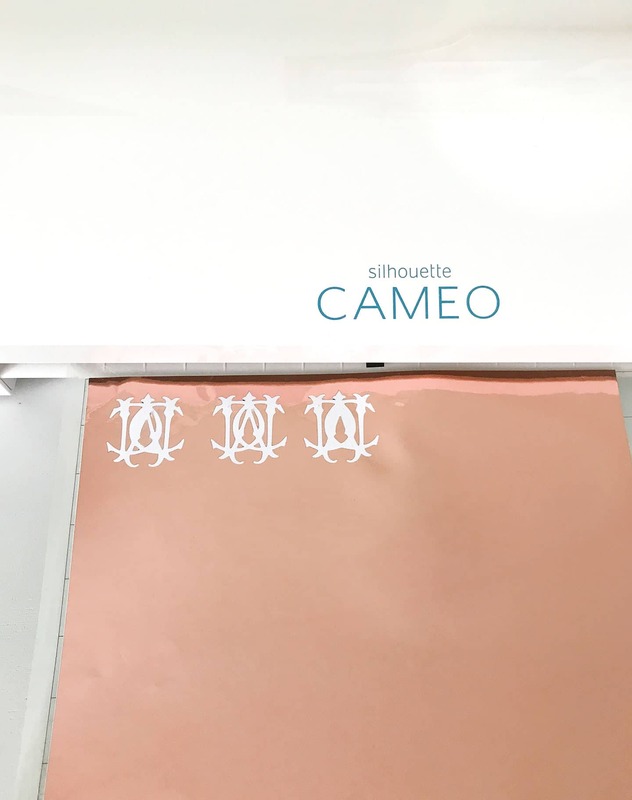 So back in May, I went to Hawaii to see all the new Silhouette products being released – including rose gold metallic vinyl! It’s such a gorgeous rose gold hue. I knew I wanted to create something with it, the question was WHAT!? It’s no surprise this southern girl loves a good monogram, but I’ve been specifically loving vintage monograms lately. A couple of years ago, I came upon an Etsy shop called Vintage Monogram who sold digitized versions of antique monograms. It looks like her shop is swamped now, but I sent her a message and she found a CWC monogram (to represent my first name, my husbands first name, and our last name). So now I love to use it to create personalized items throughout the house! Back to the rose gold! 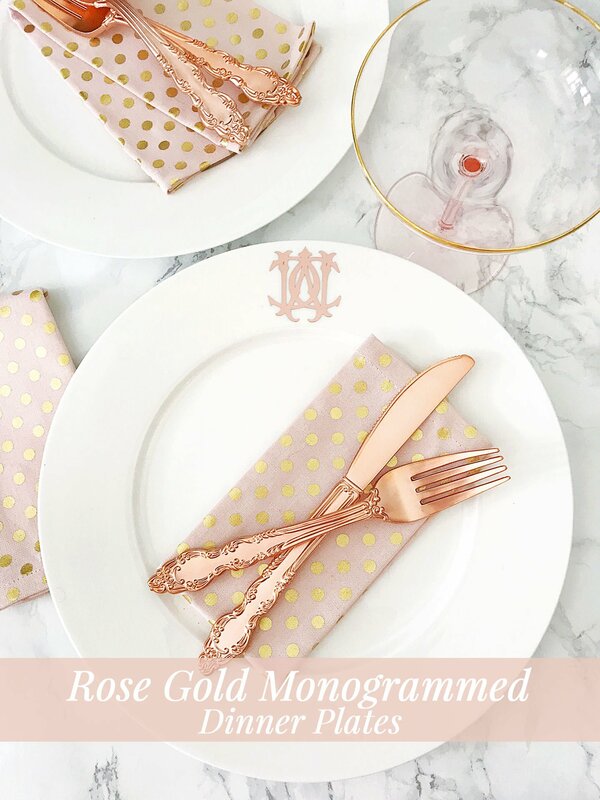 I decided I wanted to make rose gold monogrammed dinner plates. Thankfully, the Silhouette Cameo cut the monogram like a breeze (you can input any .jpg and use the trace feature to have it cut around the lines). It’s super easy and fast, kind of like when I used the Cameo to cut out 239, 425 sprinkles for Blakely’s party and party dress. So I loaded my rose gold metallic vinyl, hit send and it cut away. I already had plain white plates (found mine at Homegoods) with a white rim that were perfect for the monogram. I recommend hand-washing. They are fairly repositionable so you can adjust them or just remove them if it’s for a special occasion. 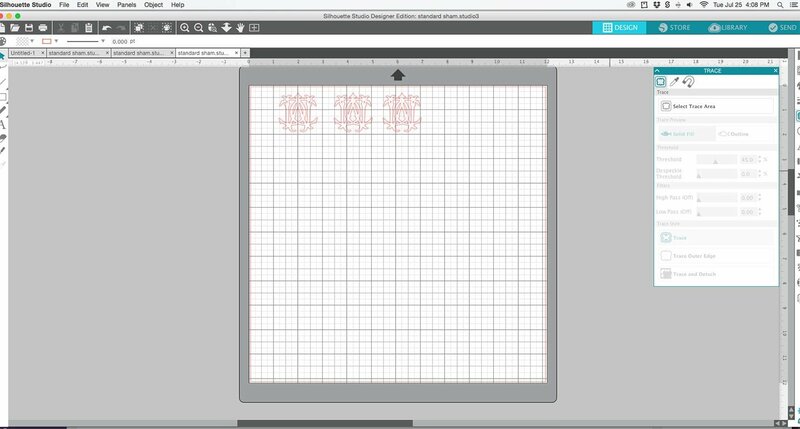 Open your monogram .jpg into the Silhouette Studio Software. You can also find a monogram font in the Silhouette store! Select your monogram (if it was a .jpg), select trace, hit trace, and drag away the original .jpg (delete it). Now you’re left with the traced monogram. You’ll load your vinyl, select send on the software, follow any guidelines there for selecting vinyl so your machine knows what it is cutting, and send away! Carefully weed away any vinyl not needed and/or peel off your monogram. Lay it carefully on the plate and press firmly to secure. Here’s a screenshot of my monograms so you get a feel for what it looks like in the software! 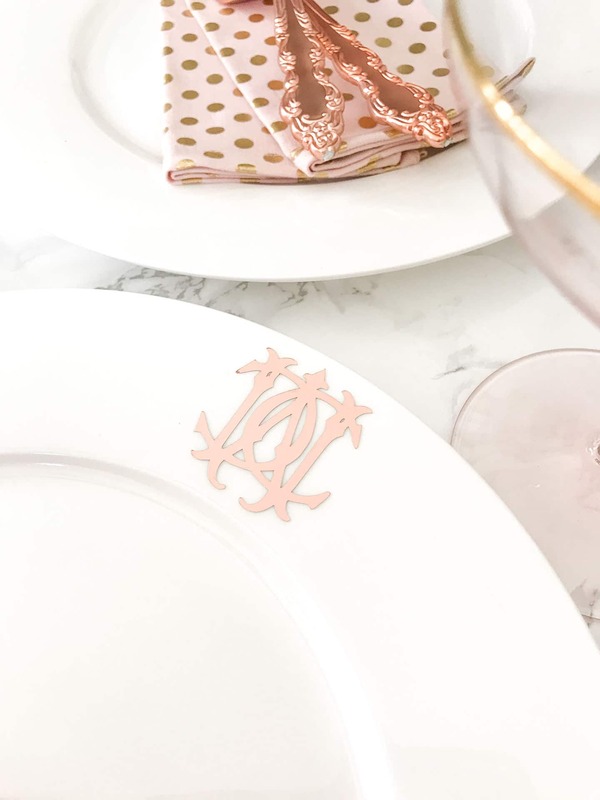 These monogrammed dinner plates truly couldn’t be easier. I mean it’s a peel and stick situation. I love *easy* DIYs that don’t require multiple trips to the hardware store as well as begging your husband to help because you get in over your head. Can I get an amen? Plus, these are darling. Can’t you imagine creating temporary personalized plates for a party, birthday, holiday? Or leave them on, hand wash, and have yourself a gorgeous set of monogrammed dinner plates. If you’re on the fence over getting a Silhouette Cameo, I love mine! I also have a Pinterest board with neat Silhouette ideas as well. You can find so many different projects and inspiration for things to make with the Silhouette. I’m going to add a vinyl monogram or name to a lot of Blakely’s school supplies soon (lunchbox, etc). There you have it, easy DIY rose gold monogrammed dinner plates! These are so adorable!! Thanks for sharing this idea. I can’t wait to try it out this holiday season! Thanks, Cassandra! Glad you love the idea too! It would be so cute during the holidays! Everyone is getting a monogrammed place setting for Christmas this year!! !